By Hadi Waqas in Internet. February 14, 2017 . Back in 2015, Google attempted to tackle the speed problem that many websites have when being viewed through on mobile device. To do so, Google developed the Accelerated Mobile Pages (AMP) platform, an open source "initiative" that lets publishers offer a version of their site that is stripped clean of third-party scripts and extensions, giving mobile device users a quicker experience. 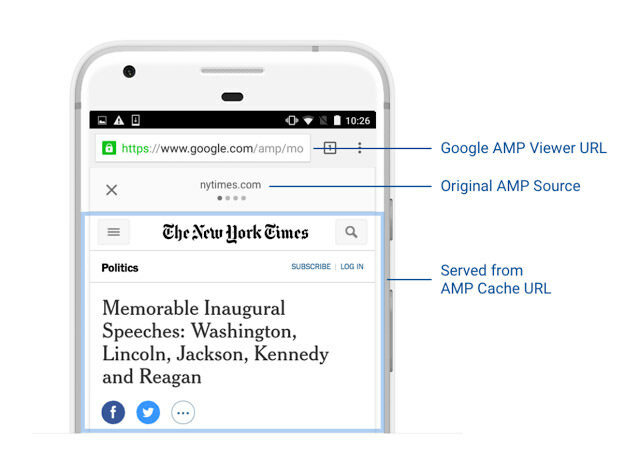 While the implementation of AMP is a great boon to mobile device users, the way the platform was implemented has lead to some misunderstandings about the platform. One of the more common misunderstandings that came with the platform is that Google had stolen traffic from publishers via AMP. This misunderstanding stems from the fact that whenever an AMP page is loaded, the address bar would show the Google AMP Viewer URL instead of the URL of the article itself. Misunderstandings aside, there are some legitimate concerns with the way the AMP’s URL system works. Because the AMP system uses three separate URLs – one from the publisher itself, one from the AMP cache, and one from the Google AMP Viewer – users who wish to share the link to a particular article may get confused over AMP’s URL system. Seeing as the AMP URL system can get rather confusing at times, Google has begun making changes to the system that would make it easier for users to share articles. The first change that has been made is the addition of an anchor button found in the AMP Viewer header. Available now on the iOS version of the Google app and coming soon to Android, users will be able to leverage their browser’s native share functionality by long-tapping on the button. Google is also working on leveraging upcoming web platform APIs such as the Web Share API to improve upon the AMP platform. 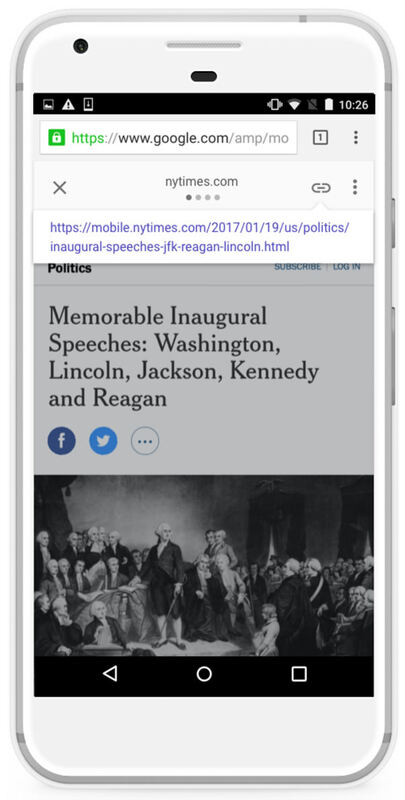 Once the API is ready, AMP viewers will be able to invoke the platform’s native sharing flow with the publisher’s URL instead of the AMP viewer’s.